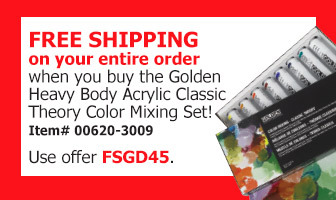 Golden Heavy Body Artist Acrylics are known for their exceptionally smooth, thick, and buttery consistency. They have the ability to "stand up" and retain brushstrokes or palette knife marks on the canvas. 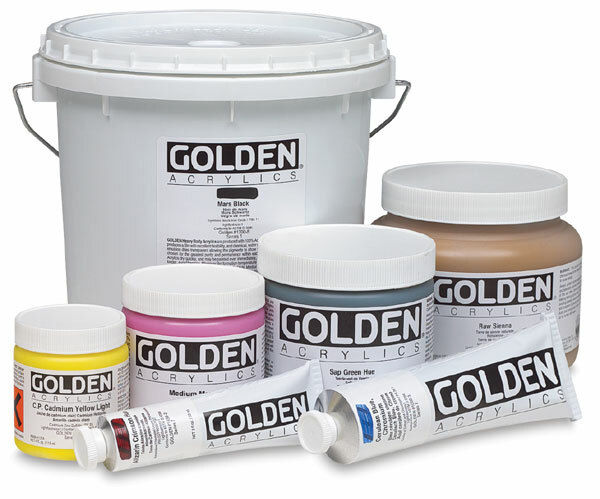 The Golden Heavy Body line also contains the largest assortment of unique pure pigments in a 100% acrylic emulsion vehicle available to the professional artist. There are no added fillers, extenders, opacifiers, toners, or dyes. 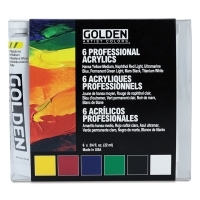 Each Golden Heavy Body color is formulated differently depending upon the nature of the pigment. Colors that tolerate higher pigment loads dry to a more opaque, matte finish, while colors that are more reactive and don't accept high pigment loading dry to a glossy finish and tend to be more transparent. Since Heavy Body Acrylics are free from additives (such as matting agents) the gloss of each color will be different. Golden Heavy Body Artist Acrylics are permanent and lightfast. A hand-painted color chart is available upon request. 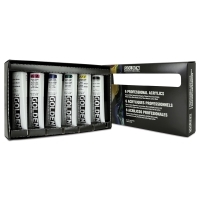 Classic Theory Color Mixing Set of 8 — An ideal starting point for artists painting landscapes, still lifes, and portraits, this set features six historically significant colors. It includes Alizarin Crimson Hue, Cadmium Yellow Light, Cadmium Red Light, Indian Yellow Hue, Prussian Blue Hue, Titanium White, Ultramarine Blue, and Viridian Green, plus a color mixing guide. 2 oz (59 ml) tubes. 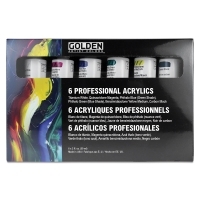 Principal Set of 6 — Establish your palette with this set of six. It contains 2 oz (59 ml) tubes of Benzimidazolone Yellow Medium, Carbon Black, Phthalo Blue (Green Shade), Phthalo Green (Blue Shade), Quinacridone Magenta, and Titanium White. 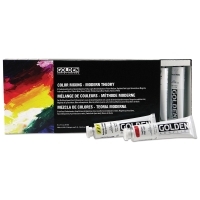 Modern Theory Color Mixing Set of 8 — Mix a wide range of remarkably clean, intense color blends that retain their brilliance even in the thinnest wash or glaze. This set of eight organic, modern colors includes Anthraquinone Blue, Benzimidazolone Yellow Light, Benzimidazolone Yellow Medium, Naphthol Red Light, Phthalo Blue (Green Shade), Phthalo Green (Blue Shade), Quinacridone Magenta, and Titanium White. 2 oz (59 ml) tubes. Introductory Set of 6 — This compact set is ideal for beginners and artists on the go. It includes 0.75 oz (22 ml) tubes of Benzimidazolone Yellow Medium, Mars Black, Naphthol Red Light, Permanent Green Light, Titanium White, and Ultramarine Blue. Note — Golden is replacing Hansa Yellow Light and Hansa Yellow Medium with Benzimidazolone Yellow Light and Benzimidazolone Yellow Medium in its acrylic sets. During this transition, you may receive a set with either yellow color. The GOLDEN MXR (Virtual Paint Mixer) is a tool which allows the artist to virtually experiment with and explore color options within the GOLDEN palette. Heavy body acrylics were the original paint line created by Golden. 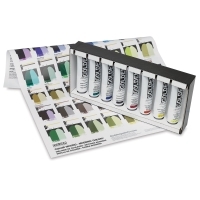 This artist quality acrylic line offers the largest assortment of unique pure pigments. No fillers or extenders are used. Each color is formulated according to the pigments unique characteristics for optimal results.